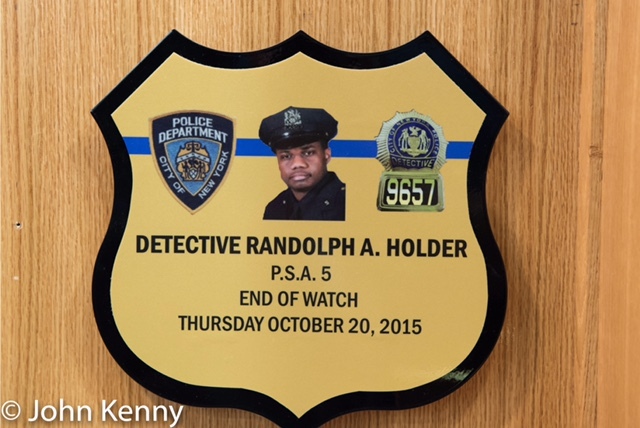 Mayor Bill de Blasio and Police Commissioner Jimmy O’Neill attended a memorial for NYPD Detective Randolph Holder this afternoon, marking one year since Holder was murdered while on duty. 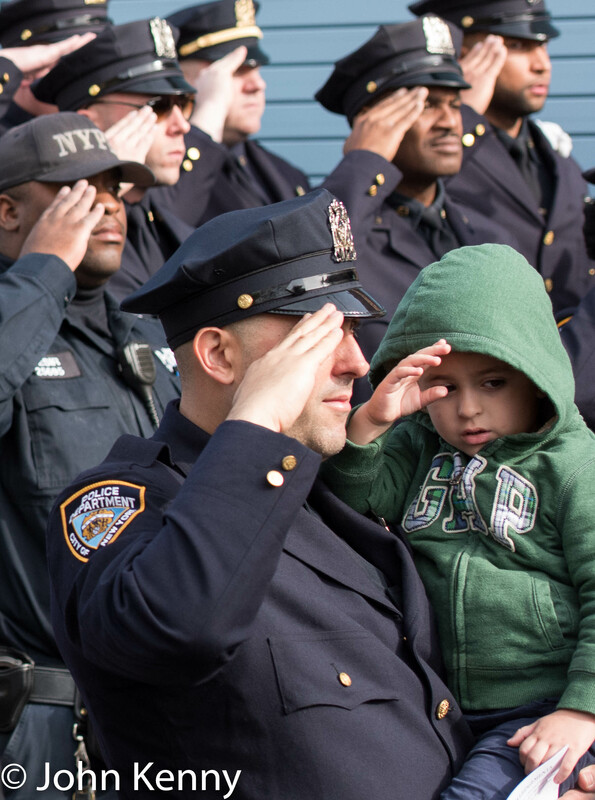 Held at PSA 5 in Harlem, the memorial included about 200 police officers and about a dozen members of Holders family. 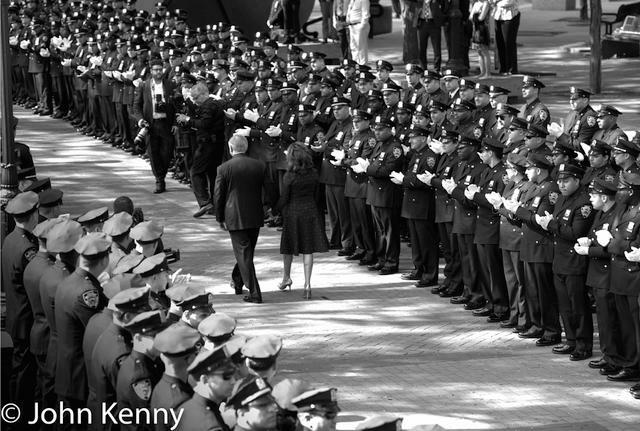 The memorial included remarks by Mayor de Blasio, Commissioner O’Neill, PBA President Pat Lynch and the current commanding officer of PSA 5, as well as Detective Holder’s father. 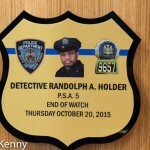 The ceremony concluded with an unveiling of a plaque dedicated to Detective Holder’s memory. 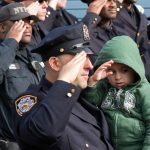 There was no discussion of politics or the variety of issues facing the NYPD and the Mayor, with the speakers focused on Detective Holder and his family, along with the at times grave challenges that police officers regularly face. 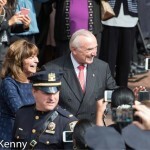 William J. Bratton concluded his second term as New York City’s police commissioner Friday with a sun-dappled stroll through a cheering crowd of several hundred police officers and invited guests. 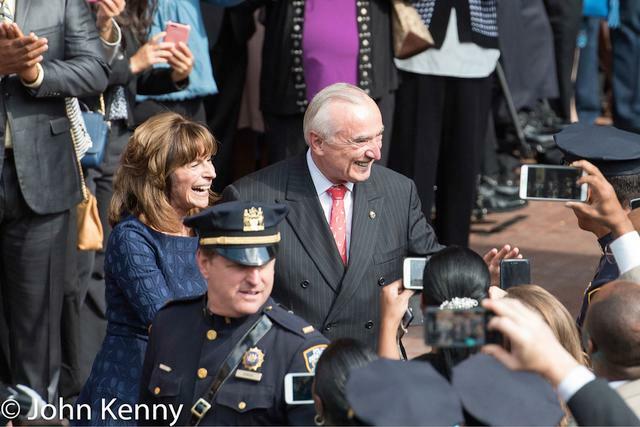 Leaving the NYPD’s One Police Plaza headquarters with his wife Rikki Klieman, Bratton smiled, waved, shook hands and hugged his way across Police Plaza. 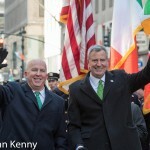 Waiting at the end of the line were his successor, Chief of Department Jimmy O’Neill, and his boss, Mayor Bill de Blasio. With some final goodbyes Bratton and his wife mounted an antique fire engine for a short ride through the arch of the Municipal Building and onto Park Row. 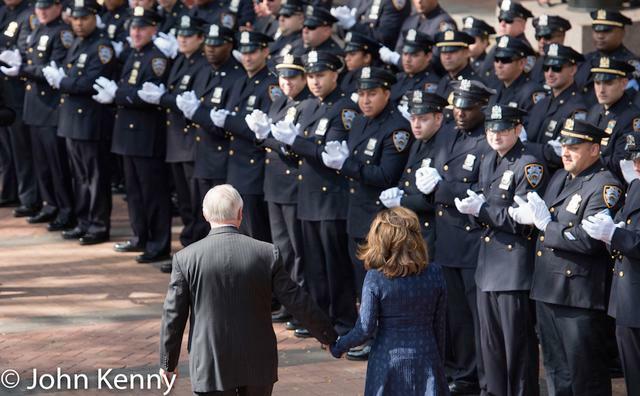 Bratton leaves behind a re-energized New York City legacy, having led the NYPD through continued declines in crime over his 32 months in office, and stood as a central figure in the de Blasio administration’s public profile. 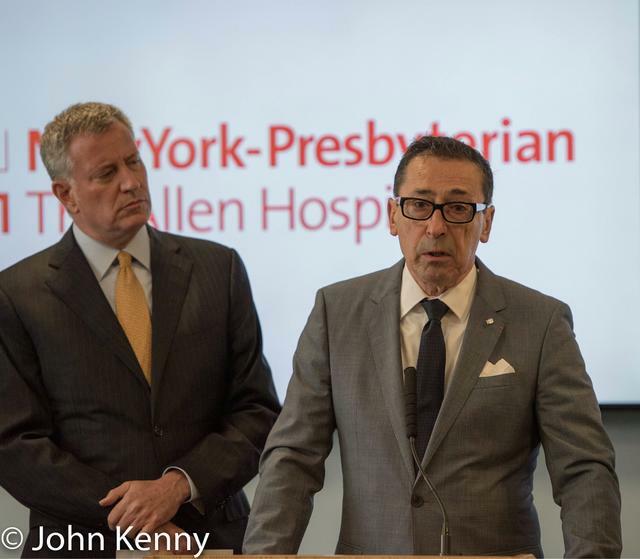 He’s been an enormous political asset to the Mayor, both for his Department’s success in continuing to push crime rates down and for his essential public role as de Blasio’s prime voice on public safety. 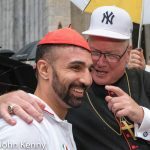 His polite Boston-accented bluntness has mostly been welcomed by the public, giving his “progressive” boss room to operate amidst a determined chorus of “hellholers”; critics who from de Blasio’s election declared that the City is destined to become a crime ridden hellhole with de Blasio in charge. 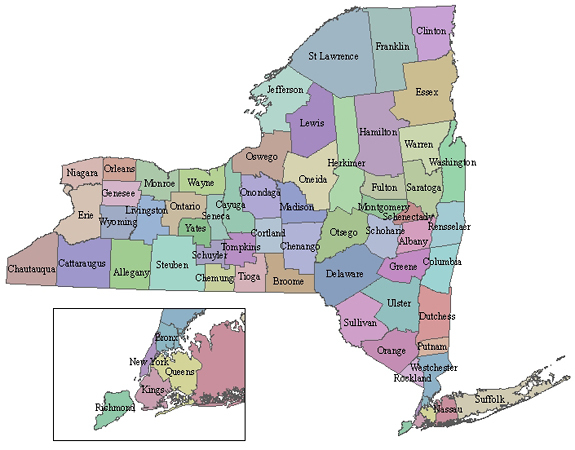 Preventing that from actually occurring and fighting the creation of a public perception that it’s occurring are both vital and Bratton largely succeeded on both. 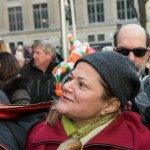 He certainly has critics though, and a small but vocal group stationed themselves near the end of Bratton’s walk. 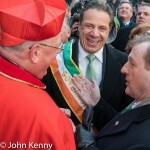 His successor Jimmy O’Neill is, so far in his career at least, not nearly as large a public personality and doesn’t display any evidence of a craving of the spotlight. 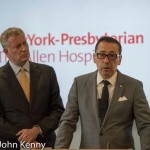 The large post-Bratton vacuum will be filled, but whether it’s by Mayor de Blasio, Commissioner O’Neill or critics is, of course, to be determined. 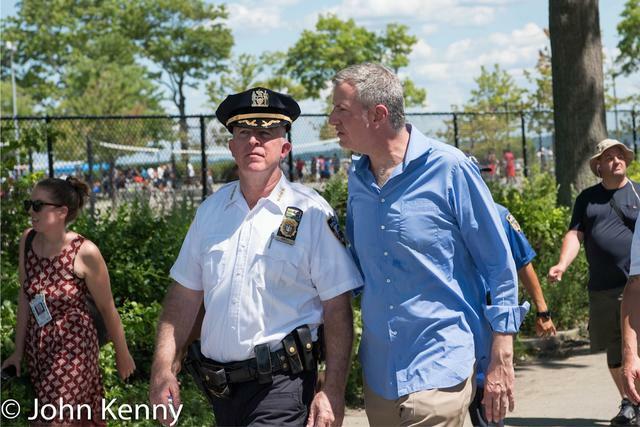 Orchard Beach, once nicknamed New York City’s Riviera for its broad crescent beach, hosted a visit from Mayor Bill de Blasio and NYPD Chief of Department Jimmy O’Neill this afternoon. 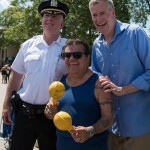 de Blasio and O’Neill, named by de Blasio as the next NYPD Commissioner, inched their way along the boardwalk for about 45 minutes posing for pictures with a steady flow of well-wishers. It was a very positive reception for the pair, with no vocal negative reactions apparent. 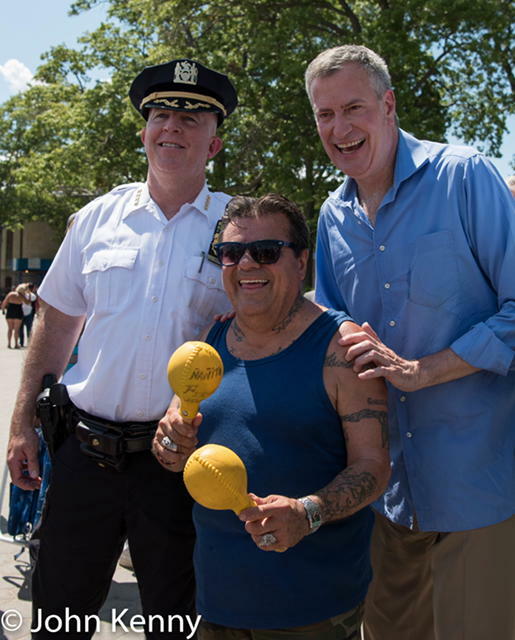 de Blasio, readily recognizable, maintained a steady refrain of “have you met our new commissioner” as he exchanged pleasantries with the stream of people approaching him. 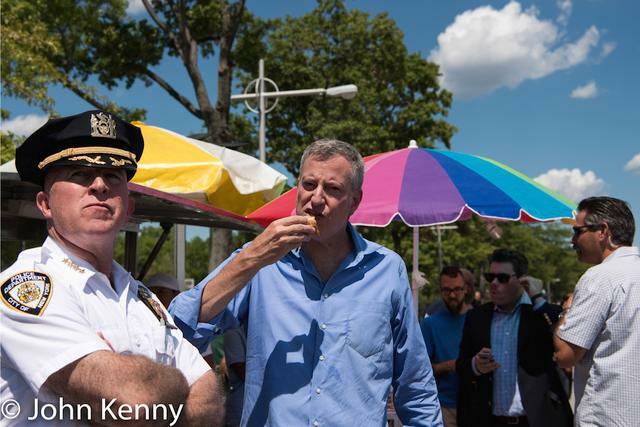 O’Neill appeared to enjoy the walk, although he was less absorbed in it than de Blasio. At times O’Neill, in uniform and still the highest ranking service member of the Department, appeared equally absorbed in what he’s done for decades – watching the goings-on around him and the operation of his Department. Mayor de Blasio and his administration face a very large transition in Commissioner Bratton’s departure, larger than in any other commissioner replacement. 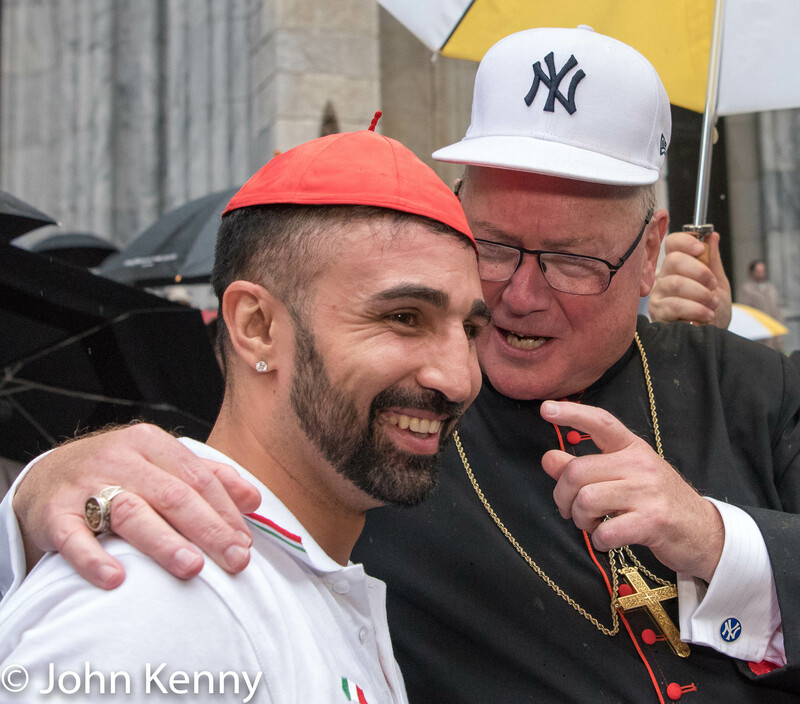 Bratton arrived as a dominant public figure, well-known to New Yorkers from his prior stint as New York’s police commissioner and enormously comfortable in the public eye, and his public visibility has dwarfed that of all of de Blasio’s other commissioners. 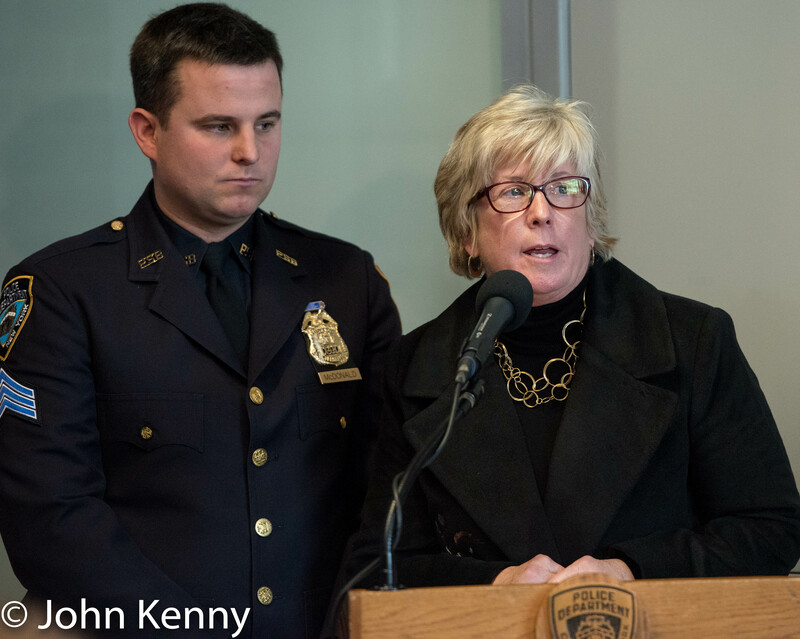 O’Neill is a very well regarded chief, but largely unknown to the public and a very different persona than Bratton. 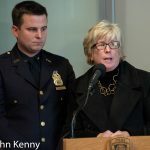 He may well succeed in both managing the NYPD and in the larger public role that comes with being commissioner, but his tenure will undoubtedly be very different as he moves into the post-Bratton vacuum.